Family-run. In the second generation. On-site worldwide. PERI can now look back on more than 45 years of experience in the industry. The great innovative force of the company and early internationalization are the cornerstones of our global success and continuous growth. The high level of customer orientation, superior quality systems and great expertise have created the trust that has made the company a leading global brand. With more than 60 subsidiaries, we are now operating on all continents with our experts, appropriate systems and services. Formwork, scaffolding and engineering. From one source. PERI provides the suitable formwork system for every concrete structure and component. The portfolio fully meets the global requirements of different construction methods and boundary conditions. 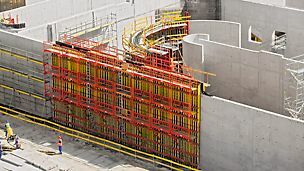 Efficient planning, selection of the most suitable system and the safe application save formwork costs. For this reason, we at PERI do everything we can to further rationalize operations and to increase user safety. The constant contact with users helps us to identify all the needs and implement developments wherever there is rationalization potential. PERI scaffolds can be used for a wide variety of applications. Regardless whether it is frame or modular scaffold, the great flexibility leads to a high level of material utilisation. Short installation times and maximum safety both during assembly and during operations – these are the users’ essential demands on the scaffolding systems. We continuously implement these requirements and always offer the appropriate system solution. The special flexibility results in a higher material utilisation and equally high economic efficiency – with simultaneously optimised assembly times. For PERI, engineering not only means product development and technical planning. 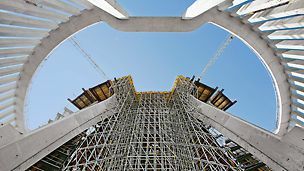 Engineering also stands for the optimisation of all processes that are encompassed by formwork and scaffolding technology. 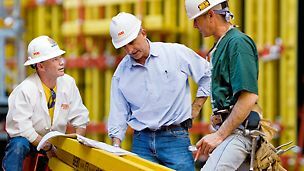 We consider process optimisation in particular and support our customers with the entire project handling. Our services help to further improve the entire process chain for every aspect of formwork and scaffolding. Beyond that we also carry out fundamental research, e.g. on new materials, to constantly improve our products.